Wood working is one of the popular activities amongst people. 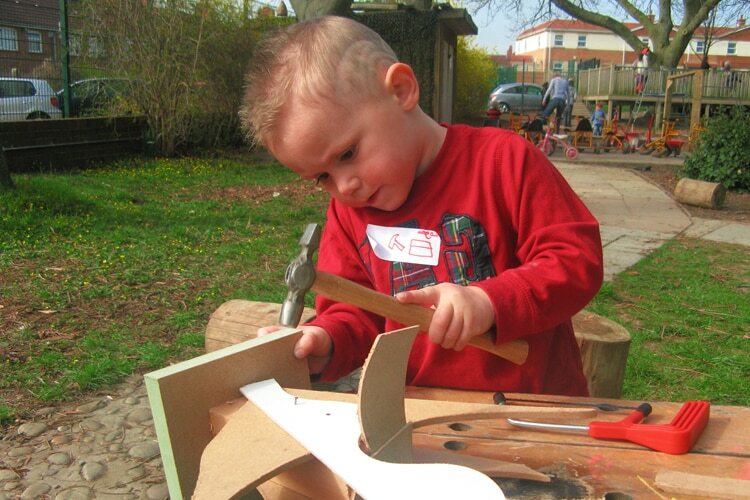 Creating mind-blowing projects from simple pieces of wood always attracts people of all ages. Although there are professional carpenters who can get the job done, it is good to allow woodworking projects for kids. Wood working is also very beneficial for kids. This past-time activity can keep kids busy for hours at a time without it ever getting boring. The urge for creating their imaginative masterpiece not only enriches their creativity but also their thought process of solving difficult problems. This is why most parents tend to award woodworking projects for kids. When the kids start wood working, they can create some basic wood working DIY projects as a starter. It may be tough for them to decide as to which project they should start from, which is why we’ve created a list of the top 10 woodworking projects that they might create right away. Tops were one of the popular toys of the 1990’s. As time passed by, electronic gadgets replaced these toys. Although it is very rare even to find these toys nowadays, these tops may be one of the many DIY projects that your kids can work on. To make a wooden top, you must at first make a flat base with rounded sides. This will act as the body of the top. Next, you must drill a hole in the center of the top so that you can place the rotating handle. To create the rotating handle, make a small wooden handle and sharpen it from one side. Then place the handle through the center of the top and apply glue to the sides. When the glue dries up, you can hold onto the handle and spin it. This toy is a great past-time for kids. To make a wooden catapult, you must take four pieces of wood and put them together to form the base of the catapult. Then take two additional pieces of wood and stick them to the base. Take two triangular pieces and put them perpendicular to each other. Screw everything to so that the structure remains solid. Observe that the structure of a catapult has been made. Afterward, take a wooden stick and drill a hole in the end side of the stick. Put a basket at the end. This is where the items that you are throwing will be stored. Take a string and put it through the holes in the ends of all the areas and tie everything together with strings. Make sure that when the basket is pulled back, it will be released at once. This will launch anything that you have in the basket. It is one of the popular woodworking ideas that still exists in the rural areas of the developing nations. Children play with the carts, with one child sitting on the cart and others pushing the one sitting. This wooden cart is a simple, but popular woodworking project that your kid may make. To make this simple wooden cart, you need three pieces of wood and three wheels. The design is simple; just make a triangular body with the three wooden pieces and attach three wheels to each side. And there you have it – your very own wooden cart. This is another custom woodworking project that your kids may take over. The rubber band racer cart is a toy that can drive itself forward with the help of a rubber band. It uses the elastic potential energy and converts it to kinetic energy, which drives the cart forward. Although it is one of the tough projects, it is surely worth it. This project will require problem-solving abilities and a great understandability of physics. This is why it is one of the best projects that your kids can work on. By following the proper steps in making the cart, they can create this awesome toy within hours. Piggy banks are small containers where your kids can store their money. The process of making such piggy banks is fairly simple, but it requires a little bit of parental guidance. Parents must shape the structure of the piggy bank before the kids try to make it. Once the structure is made, all the other processes are fairly simple. The wooden airplane is one of the small woodworking projects that your kids can tackle. It is fairly easy to create, and kids can make it within an hour or so given the right tools and parts. Kids can make their very own rocking chairs as well. Parents need to cut the wood in the proper shapes and sizes before letting the kids try. Parents should always stay beside the kids when they are making this chair. Photo frames are another small woodworking projects that your kids can try to make. This is fairly simple and can be done without parental supervision if they are given the right cut out parts. Making a wooden frame requires four wooden pieces, all having angled cuts on the edges. These edges can be joined with one another using nails. Kids are advised to use glue instead as they might injure themselves while driving the nails through the wooden pieces. Pen holders are also great for a small woodworking project. Kids can create their very own pen holder using five wooden pieces. The length and width of the four wooden pieces must be the same while one is to be used as the base. The pieces should be glued together to make a DIY pen holder. It is always good to make something that comes into good use. Birdhouses can be a great project to undertake as it will not only serve as a past-time activity for the kids but will also provide a shelter for birds to take a rest. Birdhouses are fairly simple to make but may require parental guidance. Parents must cut out six wooden pieces with the right dimensions and a hole through one of the wooden pieces. The birds will go into the house and come out through this hole. A high-quality drill press can be used to cut the hole. A pipe-like wooden piece is required for the birds to stand on. Kids can use glue to attach each wooden piece to each other. Some hay or cotton can be placed inside the house so that the birds feel comfortable while they’re inside. Afterward, the birdhouse should be kept in the garden or the yard. Bird food may also be given to lure them into your DIY aviary. Woodworking projects for kids can be a great pastime activity that not only educates the little ones but also instills a sense of duty in them. It not only enhances their imagination and creativity but also increases their problem-solving ability. Parents must be careful that the kids don’t use any woodworking power tools, as doing so might cause injuries. Parents are advised to observe their kids when they’re working on the project to avoid any accidents. Try to use high-quality woodworking equipment when working with wood. With the proper guidance, kids can make one of the best DIY projects and showcase it in the home. This will boost their mentality and make them feel achieved and satisfied. 2 How to Cut a Straight Line Appropriately with a Reciprocating Saw?